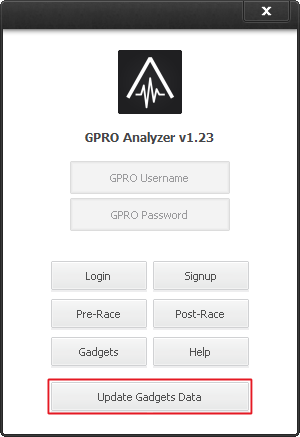 GPRO Analyzer is a tool designed for the GPRO managers. The main objective is to gather the most important data, and provide online statistical analysis to the manager in a very usable way. Collected data and analysis can be shared with other managers. Software for gathering data works only on Windows operating systems. It does not require any additional software to be installed on your computer. Update should be done twice per race. First (Pre-Race), after qualification and before a race, after you have updated your car or trained your driver. Second (Post-Race), after a race, before you have updated your car or trained your driver. You have to finish the race to be able to do Post-Race update. 1. Download the software for gathering data (Latest version: 1.27 - April 3, 2019). 2. Enter your GPRO login information. 3. Click on the "Pre-Race" button for Pre-Race update. Click on the "Post-Race" button for Post-Race update. You can automatically load data from GPRO into gadgets by clicking the "Update Gadgets Data" button.